Slash will always be known as the top-hatted guitarist for Guns N’ Roses, but he’s built quite a body of work in the 15 years since leaving that band. 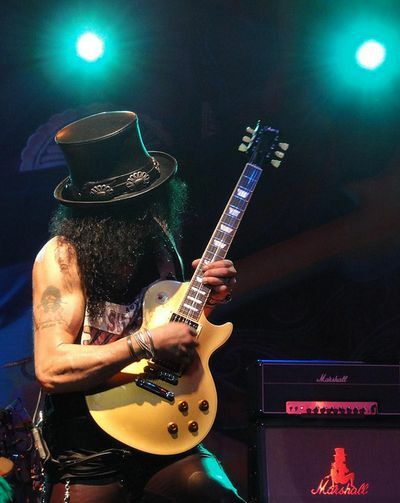 Thursday night at Harrah’s Voodoo Lounge, Slash drew on all phases of his career – Snakepit, Velvet Revolver, his new solo album and, of course, Guns N’ Roses – during his two hour performance. After a strong opening, the set got even better. 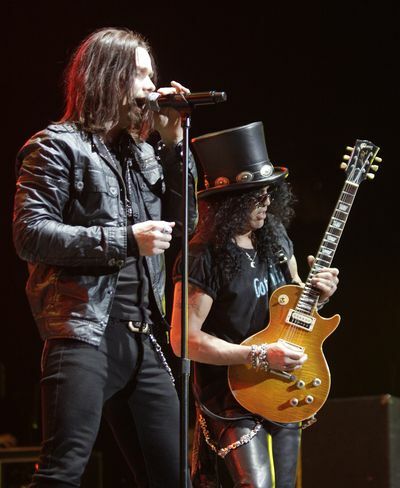 “Back to Cali,” another new track, opened with vocalist Myles Kennedy of Alter Bridge and Slash standing shoulder-to-shoulder during a heated call and response that brought to mind Jimmy Page and Robert Plant. Both “Cali” and “Do It for the Kids” rocked harder than anything Slash’s former band came up with for “Chinese Democracy.” “Civil War” and “Rocket Queen,” two of the brightest moments from Slash’s Guns glory days, came next. 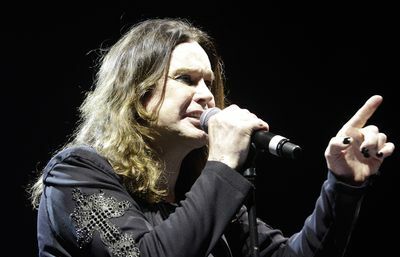 Guitarist Zakk Wylde once said playing with Ozzy Osbourne was like being in a glorified cover band, because the performances encompassed material from different eras and songwriters. The same could also be said by Slash’s four new band mates, but they didn’t seem to mind helping Slash recreate his finest moments any more than Wylde did with Ozzy. Kennedy easily conjured the ghost of Axl Rose, replicating his vocal tics right down to the radio commentary at the end of “Civil War.” He had no problem nailing the high parts on “Rocket Queen,” either. Together, Kennedy and bass player Todd Kerns – who delighted romping around the stage and lip synching to all the Guns N’ Roses songs – came close to capturing the spirit of Velvet Revolver singer Scott Weiland’s tone. If the first half of the concert was a showcase for great songs Slash helped write, the second half was dedicated to showing off his guitar skills. Slash is the king of the oily riff that goes down smooth and leaves you feeling dirty. Those skills, however, tend to perish without the structure of a song. Kennedy held the mic stand over the re-ignited crowd and let them lead the chorus, a trick he would perform again a few minutes later during “Paradise City.” The closing song, it encapsulated all the best elements of the night: energetic crowd participation, big riffs, great songwriting and killer solos. The night ended with some of Slash’s best solos as the ensemble stretched out over the melody. For $30 fans could take home a recording of the concert. A line was already forming at the table in the back as the band took their final bows. The CDs are a nice souvenir for dedicated fans, but it’s hard to imagine any casual “best of Slash” playlist deviating too much from what he delivered onstage. Setlist: Ghost; Mean Bone; Nightrain; Sucker Train Blues; Back from Cali; Do It For the Kids; Civil War; Rocket Queen; Fall to Pieces; Just Like Anything; Nothing to Say; Starlight; Watch This; blues jam > Theme from “The Godfather” > Sweet Child O’ Mine; Rise Today (Alter Bridge cover); Slither. Encore: By the Sword; Communication Breakdown (Led Zeppelin cover); Paradise City. In the wake of Michael Jackson’s death, I wrote about the Michael I liked best. The young Michael, who fronted the Jackson 5, grew into his own and delivered his greatest statement and one of the best pop/dance albums ever on the cusp of the ’80s. But that isn’t the Michael Jackson I remember. I recall the Jackson’s Victory tour kicking off at Arrowhead in 1984. Everyone at swim lessons that day was talking about it, but I didn’t really know who Michael was and what the fuss was all about. I have no memories of Michael’s follow-up stops at Kemper Arena four years later. Later, all I knew about Michael Jackson were the Weird Al parodies, the “sha-mon” self-parodies and – Eddie Van Halen and Slash’s guitar solos aside – a bunch of slick pop that didn’t conform to my burgeoning rockist sensibilities. Retrospectively, it’s easy to turn the finger on myself and laugh at how ignorant and dismissive I was at the time. In my defense, “Bad” and “Dangerous,” the two Michael Jackson albums that hit when I was coming of musical age, were unsuccessful attempts to replicate “Thriller.” By the time giant Jacko statues were floating in the Thames River to promote “HISstory,” Jackson was so far removed from his glory days and so entrenched in the paparazzi-enabled tabloid journalism that defined his life that I couldn’t take him seriously as an artistic force. When someone tried to explain to me that the ghost-white, thin-nosed Jacko on the talk shows was the same African-American child who sang those Jackson 5 songs, I balked for two reasons. Firstly, it’s still hard to believe anyone could transform so drastically over such a short period of time. More importantly, however, those songs were great! They may have been created with the same crass marketing motives that plagued post-“Thriller” Jackson, but somehow this stuff more than held up. One of the guys in my dad’s National Guard unit used to play “ABC” so often that my dad said he never needed to hear the song again. I can see where my dad was coming from; that could be pretty annoying. But I can also understand the impulse to play that song over and over. Great songs create a world we get to live in for a few minutes. Usually that world vanishes into the next track sooner than we’d like, and when it does you have the immediate desire to return. At two minutes, 30 seconds, “ABC” is not long enough. Fortunately, I can make a playlist shoving “ABC” against “I Want You Back,” “Black and White,” “I’ll Be There,” my all-time favorite Michael jam “Don’t Stop ‘Til You Get Enough” and the rest of his finest moments. It will be in the air for the rest of the weekend, allowing me to live in Michael’s musical world once again.